Make an excellent first impression of your home or business with clean and well-maintained hard surface floors. When your floors are maintained correctly, clean surfaces such as hardwoods, tile, or vinyls can really add to the professional atmosphere for your employees and guests. 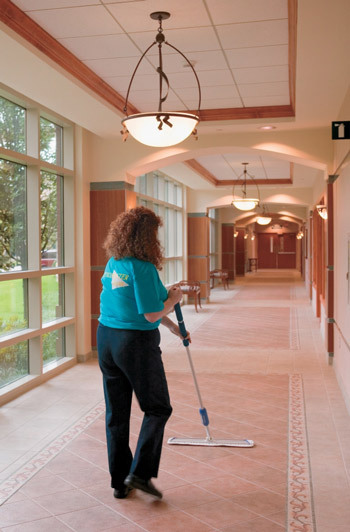 Beautiful and clean floors not only look impressive but also provide a clean and safe environment. Keep your hard surface floors looking their best with ServiceMaster by Gadonniex. We are experts in cleaning all types of floors. Rely on our expertise to ensure that all types of flooring you have receives the proper maintenance program. Vinyl (VCT), Sheet Vinyl, Linoleum: Vinyl, also referred to as resilient flooring, is a finished flooring material composed of colored polyvinyl chloride (PVC) chips formed into solid sheets of varying thicknesses by heat and pressure. The materials that vinyl is made of have some elasticity, giving the flooring a degree of flexibility called resilience. Modern vinyl floor tile is frequently chosen for high-traffic areas or performance surfaces (dance or athletics) because of its low cost, durability, and ease of maintenance. Vinyl tiles have high resilience to abrasion and impact damage and can be repeatedly refinished with chemical strippers and mechanical buffing equipment. If properly installed, tiles can be easily removed and replaced when damaged. Hard Flooring (Ceramic Tile, Concrete/Cement, Natural Stone Tile): Hard flooring (not to be confused with “hardwood”) is a family of flooring materials that includes concrete/cement, ceramic tile, glass tiles, and natural stone products. All stone is porous to some extent and sealing natural stone is highly recommended. Since there is a wide variety of hard flooring, each material requires a unique process of cleaning and care. Marmoleum: Marmoleum is a natural and environment friendly linoleum flooring made from 97% natural raw materials along with a 43% recycled content. It is a brand of linoleum flooring (or resilient flooring). Wood Floors: Many different species of wood are fabricated into wood flooring in two primary forms: plank and parquet (parquetry is a geometric mosaic of wood pieces used for decorative effect). Just like with hard flooring, since there is a wide variety of wood flooring, each type of material requires a unique process of cleaning and care. Carpet: Carpet is a floor covering woven or felted from natural or man-made fibers. Fitted carpet is attached to the floor structure, extends wall-to-wall, and cannot be moved from place to place. An underlay (carpet padding) will extend carpet life and improve comfort. No buffing! : By eliminating the frequent buffing, recoating, and stripping processes that traditional finishes require, customers will achieve a positive ROI (return on investment) and have better-looking floors. Zero-VOC: No volatile organic compounds.